You are in West London and have no idea what to do for a weekend out? Don’t worry! Whether you are in the mood for some outdoor activities, shopping, visiting a museum or a concert, we have you covered. If you are craving culture, head to Eventim Apollo, one of London’s top live entertainment venues. Built in the 1930s as an art deco cinema, it is also one of the largest and best-preserved original theatres in the UK. It is a great venue for music concerts and stand-up comedy. Eventim Apollo hosted some of the best Beatles gigs from 1964-1965, David Bowie’s last concert as Ziggy Stardust in 1973 and several gigs by Queen in 1979. It has appeared in a number of music DVDs from the likes of Kylie Minogue, Robbie Williams and Kings of Leon. In addition to music, Eventim Apollo has a first-rate array of dance, comedy and children shows from the biggest names in the business, from ‘Riverdance’ to SpongeBob Square Pants to Russel Band. West London has plenty of vast green spaces, perfect for a picnic. 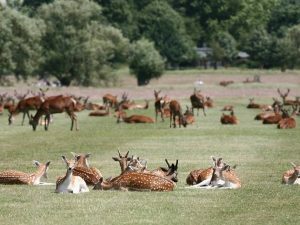 One of them is Richmond Park, one of the most beautiful and the largest of London’s Royal Park, created by Charles I as a deer park. At Richmond Park, you can enjoy many outdoor activities, including cycling, kiting golf and horse riding. It is of international importance for wildlife conservation. Its ancient trees, rare wildlife, wide open spaces, grasslands and deer herds are guaranteed to bring you in touch with nature. There are plenty of options for sports fans to spend their weekend in West London. If you are a football lover, visit some of the legendary stadiums: Stamford Bridge, Craven Cottage, or Loftus Road Stadium. There are also several golf fields, many parks and recreation grounds for an active day out. Don’t miss street market on Portobello Road, at a walking distance from Notting Hill Gate Tube. Every Saturday, you will find hundreds of stalls selling clothes, bric-a-brac, antiques, shoes, vintage, music, food and more! Go to Holland Park for a great mixture of culture and nature. It has art colony, peacocks, sports facilities, woodland, play areas and an eco-centre. One of its best-kept secrets is the magnificent Kyoto Garden: a beautifully designed Japanese garden, created as part of London’s Japan Festival in 1992. You can also visit one of the two nearby museums: Leighton House and Design Museum. Lord Leighton was an eminent Victorian artist who envisaged his home as a tribute to art. After years of neglect, his 19th-century house was turned into a gorgeous art palace in 2010. Design Museum covers industrial, product, fashion, graphics and architectural design. Exhibitions will inspire you and you will have the opportunity to learn something about the history of contemporary design. It is open every day from 10 AM to 6 PM. Entrance is free.